The KOENIG Check Valve ® is simple to install and a reliable solution to control flow directions in fluid systems. Metal-to-metal seal prevents side leakage. No additional sealant or adhesive compounds – eliminates contamination risks. Self-retained part, anchored safely in vibration environments. 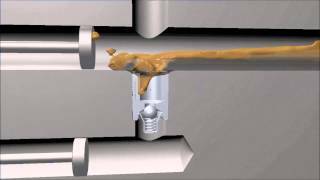 The KOENIG CHECK VALVE® easily installs into an as-drilled hole. It is simply dropped into a counterbored hole. The integrated pin is then pushed inside to expand the sleeve. The grooves on the outside of the sleeve anchor into the base material for clean installation. KVT-Fastening provides a range of CHECK VALVE® for various application requirements. The cracking pressure can be optimized to your system requirements; this allows you to have complete design control. Please contact us to discuss your custom requirements.